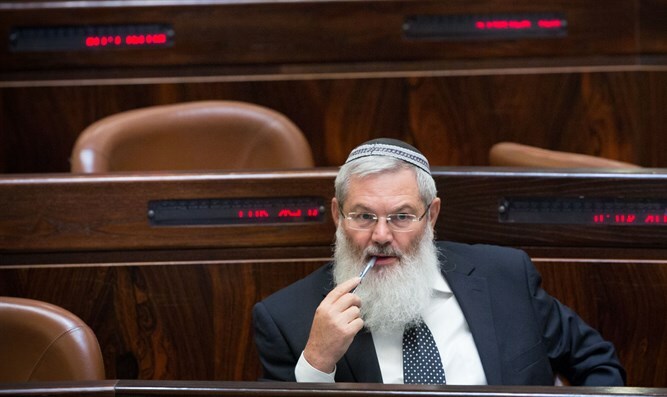 Activists demand Health Minister Litzman condemn offensive caricature portraying Deputy Defense Minister executing yeshiva students. Dozens of deputy mayors, branch heads and other Jewish Home activists sent a sharp letter to the Health Minister, Yaakov Litzman (United Torah Judaism), demanding that he condemn the insulting caricature which was published in the Hapeles newspaper against Deputy Defense Minister Eli Ben Dahan. The caricature portrays Ben Dahan as a hangman dressed in sports clothes a moment before he ties the "recruiting rope" around the neck of a Yeshiva student. This despite to his struggle to defend the haredi recruits and his efforts to combat the incitement against them. "Even if the newspaper which is distributed in thousands of copies does not belong to your camp, as a representative of the haredi community in the Knesset and the government your silence could be interpreted as acquiescence to this caricature" wrote the Jewish Home members. "Whoever holds the flag of Torah high cannot be silent in the face of insults to any Jew. All the more so when they refer to a public servant and rabbi whose entire 'crime' was promoting the ideology for which he was chosen to serve in the Knesset." The head of the committee of local branch heads of the Jewish Home party, Amiad Taub, said "we decry the humiliating attitude towards our representative, Deputy Defense Minister Rabbi Eli Ben Dahan, a man of the book and the sword as well as a true and authentic public servant." "We demand that the representatives of the haredi community in the Knesset and the government make their voice loud and clear that not only does the incitement not stem from their quarters but it is also unacceptable in their camp," stressed Taub.